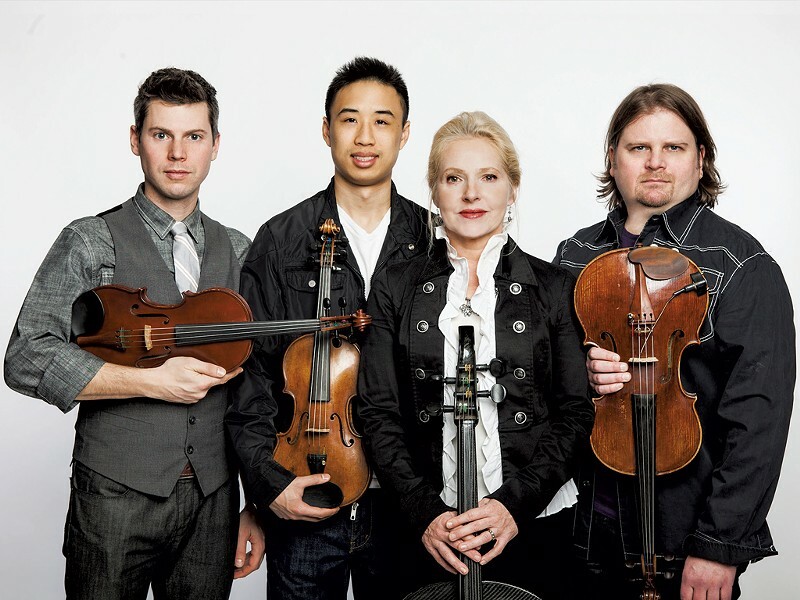 When violinist Mary Rowell of Craftsbury and three fellow contemporary-music enthusiasts were brainstorming a name for their quartet back in 1998, Rowell hit on ETHEL. (She was recalling the movie Shakespeare in Love, in which Romeo's great love in the Bard's first draft is named Ethel.) A woman's name thus came to describe what is now a leading new-music quartet. That has a certain resonance in a classical world whose programming remains male-dominated, and in which cutting-edge quartets, such as San Francisco-based Kronos Quartet and New York City's JACK Quartet, often have masculine-sounding names. Fittingly, ETHEL will present a program of 21st-century works by women next Friday, March 24, as part of the Lane Series at the University of Vermont. The concert will be a mix of groundbreaking new pieces and recognizable pop music arranged by ETHEL's own players, who are all composers as well. Lane Series director Natalie Neuert says the concert will have an "extreme audio component" that will appeal to students and fans of electronic music. The program, called "Blue Dress," is named for its final piece, Blue Dress for String Quartet (2015), a work ETHEL commissioned from composer Julia Wolfe. A cofounder of the new-music collective Bang on a Can, Wolfe won the Pulitzer Prize in 2015 and a MacArthur Fellowship "genius" grant in 2016. Her music often has a driving beat; Blue Dress is influenced by bluegrass and requires the musicians to hum, sing and stamp their feet. Wolfe actually inspired the formation of ETHEL, says cofounder and cellist Dorothy Lawson, who spoke by phone from New York City. (Rowell left the group in 2011 to reduce her touring schedule, she explains in an email.) The foursome read through the composer's 1993 quartet Early That Summer and decided on the spot to make new music their focus. Accompanying Wolfe's work on the program are a piece by her student Anna Clyne, called Roulette (2007), another ETHEL commission; Missy Mazzoli's Quartet for Queen Mab (2014); and Lawson's own Chai — her first work written for the quartet. Lawson says the group asked each composer to name one female pop influence. Wolfe named Aretha Franklin, Clyne cited Stevie Nicks, and Mazzoli and Lawson both chose Janis Joplin. ETHEL's violinists, Kip Jones and Corin Lee, then composed arrangements of Franklin's and Nicks' work, respectively. Violist and ETHEL cofounder Ralph Farris took on Joplin. "We like the audience to have things they can relate to as well as things they haven't heard before," explains Lawson. "And also, we want people to have fun." ETHEL perform three or four different programs throughout the year; the group began presenting variations of "Blue Dress," sometimes with a video component, a year ago. So, while the quartet's UVM appearance coincides with Women's History Month by design, the all-female program wasn't meant to be siloed. "I feel there is a new strength, a real security in the works of women," the cellist adds, assessing the growing field of 21st-century female composers. "There's a real ferocity there." The original print version of this article was headlined "Female Ferocity"